A tea selection pack is the ideal gifts for tea lovers, whether you want to treat yourself or someone else! Available as loose tea or tea bags, so that you are sure to find what you are looking for: great gift ideas for Mother's or Father's Day. Find all the biggest names in the world of tea : Compagnie Coloniale, Dammann Frères, Palais des Thés, English Tea Shop, Harney and Sons, Lipton and many more! Give in to temptation with this "Seduction" gift set from Dammann Frères. It contains 32 individually-wrapped Cristal® sachets, 4 different flavoured teas (Miss Dammann, Nuit à Versailles, Jardin Bleu, Goût Russe Douchka). All presented in an elegant box. Enjoy fabulous flavours from Comptoir Français du Thé with this tea selection. The Bon Voyage box contains 20 individually-wrapped tea bags with 4 different flavours (Japan Lime, Oolong salted caramel butter, Fruity black tea "Christophe Colomb" and a fruity Black and Green tea blend "Thé des Amoureux"). 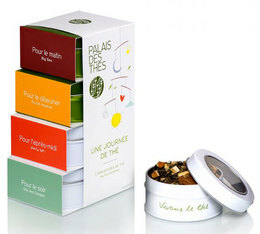 Travel to different worlds with this luxury 'Paradis sur Terre' gift box by Comptoir Français du Thé. 36 sachets, 6 different gorgeous flavours. Discover this elegant "Charmes" box by Dammann Frères. 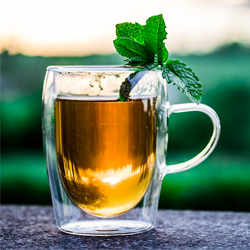 A lovely selection of 4 herbal teas for a moment of calm and relaxation. 32 Cristal® sachets. Discover the Horizons gift box from the Voyages Collection by Dammann Frères. This box contains 4 tins of loose leaf tea (2 flavoured green teas, 1 flavoured black tea and 1 rooibos) + an infuser. This Lointains gift set from the Voyages Collection by Dammann Frères transport you to faraway places with each cup ! 4 tins of flavoured loose leaf tea (2 Green teas, 1 white tea and 1 carcadet infusion) + tea infuser. Discover the ‘Comédie' tea gift box by Dammann Frères. Presented in a gorgeous silvery grey metal box, this set contains 3 tins of high quality flavoured loose leaf black teas and a tea infuser. 30g each. 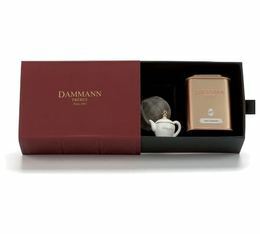 Discover the ‘Cabaret' tea gift box from Dammann Frères. Presented in a gorgeous green metal box, this set contains 3 luxurious flavoured green teas and a tea infuser. Discover the ‘Entracte' tea gift box from Dammann Frères. Presented in a gorgeous metal green case, it contains 36 sachets of 6 different types of flavoured teas (green and black tea, Oolong...).